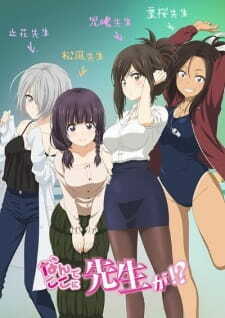 Adaptation: Nande Koko ni Sensei ga!? This is my first anime review, so I don't quite know how this works. I might decide to make more in the future! Wait... what? This is an anime? All well, let's get on with the review. And... I don't even know what to say. I don't think I need to describe the plot (because it has no plot (so far anyways)), you can search it up if you want. Pretty much every moment of this anime is fanservice. So if you're looking for an anime with a deep, intriguing plot, this anime is not for you. Despite the lack of plot and character development, I've actually enjoyed the show. The art is pretty good and the animation is smooth. So... I guess I'll just score the anime!